Genie Bouchard played so poorly in her 6-4, 6-3 loss to 19-year-old Czech Marketa Vondrousova in Thursday’s second round at the US Open that she was reduced to an expletive to try to explain the debacle. Questioned as to whether she had had any sense before the match that she might have such a dreadful performance, she replied, “I didn’t know beforehand, no. On the court, I really didn’t feel like myself. That’s very disappointing, considering how good I felt in my last couple matches. Yeah, I mean, I played like excrement. That wasn’t the exact word used but both describe how badly she felt about her tennis, as well as the extent of her frustration. She lost her opening service game but slightly righted things by getting back to 3-all. That was beginning of a series of blunders and missed opportunities. Every time she got back into a set – at 3-all and 4-all in the first set – and 3-all after trailing 3-1 in the second, she lapsed into unforced errors and was never able to assert her superior power off the ground against the determined but unexceptional No. 103-ranked Vondrousova. And it wasn’t as if the Czech didn’t give her opportunities with ill-advised drop shots and four foot faults called against her in the first set – including one on second-serve ace at set point in the first set. But she managed to recover and close out the set two points later. The height of Bouchard’s frustration occurred in the seventh game of the second set when she doubled-faulted for the second time in the game to fall behind love-40. She tossed her racquet (above) into a back corner of the court and was fortunate not to have received a warning. The coup de grace was a lob winner by Vondrousova that Bouchard couldn’t retrieve on the ultimate match point of the one hour and 26-minute encounter. On the stats sheet – Bouchard’s winners to unforced errors ratio was 14/32 while Vondrousova was 15/25. It was one of those days for Bouchard, who has never had her best results at the US Open. She did say that she continues to work with legendary California coach Robert Lansdorp. Sitting in the stands Thursday supporting her (clapping above) on Court 17 were her physio Scott Brynes and Sylvain Bruneau, director of women’s tennis for Tennis Canada. As for her future plans, Bouchard said she will play next week in the $150,000 Oracle Challenger Series event – a $125K level WTA tournament – in Chicago. After that, she intends to go to events in Asia, so it appears she will not play the National Bank Cup tournament in Quebec City from September 10-16. She leaves the 2018 US Open disappointed but at least with her ranking marginally improved as it will rise from No. 137 to about No. 112 as a result of her three qualifying wins and a 6-3, 6-1 victory in the first round over 20-year-old French wild card Harmony Tan. In hindsight, maybe the three qualifying wins – with a total of just seven games lost – were too easy for her and didn’t prepare her for competition like Voudrousova who was definitely a cut above. Gabriela Dabrowski advanced to the second of both the women’s and mixed doubles on Thursday. 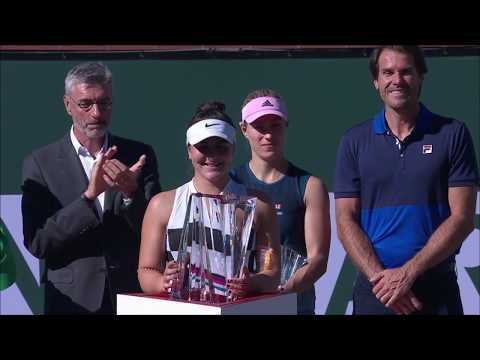 In the morning she and partner Yifan Xu of China, seeded fourth, defeated Lara Arruabarrena of Spain and Renata Voracova of the Czech Republic by the score of 6-2, 6-7(5), 6-1. They will now face the unseeded pairing of Sam Stosur of Australia and Zhang Shuai of China. Later on Thursday, Dabrowski and Mate Pavic of Croatia, seeded No. 1, won their mixed doubles opening round 6-0, 6-4 over Jamie Loeb and Noah Rubin of the U.S.
Dabrowski and Pavic lost in the first round at Wimbledon after winning the Australian Open and being runners-up at Roland Garros in the first two Grand Slams of the year. In men’s doubles, Vasek Pospisil and Fernando Verdasco were slated to play their opening round but they withdrew because of what was listed as a Pospisil back injury. Milos Raonic and Denis Shapovalov have both won two rounds at the 2018 US Open – but now comes the hard part. Both face challenging opponents in Friday’s third-round action. Raonic, seeded No. 25, will play three-time Grand Slam champion Stan Wawrinka in the 7 p.m. evening match in Louis Armstrong Stadium after Shapovalov takes on fifth-seed Kevin Anderson – third after two women’s matches – in the Armstrong afternoon session somewhere between 2 p.m. and 4 p.m. ET. Both Canadians probably enter their matches as underdogs. Wawrinka, rounding into form after left knee surgery last summer, has a 4-1 head-to-head advantage over Raonic but it’s a very close to 50-50, pick ’em kind of encounter. Raonic will have to use the backbone of his game – his serve – to apply pressure on Wawrinka and his mighty backhand, hoping for a few good swings of his own and some slip-ups by the 33-year-old Swiss to get him the service breaks he needs. With Shapovalov and Anderson meeting for the first time, it will be the 19-year-old lefty who will try to neutralize the 6-foot-8 South African’s big serve with some service firepower of his own and a baseline game that’s capable of overwhelming just about any opposition. The weather is taking a turn from the desperate heat and humidity of the US Open’s first four days with temperatures cooling off to about 24 degrees accompanied by a 60 per cent chance of showers on Friday. That’s a problem for players scheduled on courts other than Arthur Ashe and Louis Armstrong. But with both Shapovalov and Raonic set for Armstrong, the new retractable roof could come into play for the first time. Weather be damned, the Raonic–Wawrinka and Shapovalov–Anderson contests should go off as scheduled. This is a bureau of the New York Police Department in the borough of Queens. It’s safe to say it probably wouldn’t be a good thing to be the owner of the BMW convertible in the picture above.